Beyond dropping a theological bombshell, the sermon ushered in a new era, one in which synagogue-attending Jews could increasingly expect to be confronted with the findings of academic study of the Bible. To Rabbi Wolpe, intellectual honesty mandated that, with respect to the exodus in particular, these findings be not only confronted but embraced, and it was the duty of spiritual leaders like himself to help the faithful assimilate them. One might be tempted to ask: what’s the big deal? For some, indeed, there is none: to admit there never was an exodus is a matter of simple honesty, and need have little or any deleterious effect on one’s appreciation of Judaism. To the contrary: Bible stories, we are told, speak to us in symbolic terms; God’s voice is in the message of the exodus story, not in its supposed facts, and that message, once shorn of its mythological baggage, is only strengthened. On this latter view, were there no exodus, nearly all of Judaism’s sacred texts over the centuries would have perpetuated a great lie. In response to the question posed by the child at the seder meal, “How is this night different from all other nights?” a father would be obliged to reply, “Really, my child, there’s no difference.” And indeed, at many a contemporary seder table, a new figure has emerged: next to the son who knows not how to ask, sits the father who knows not how to answer. In what follows I offer that father three helpings of scholarship to help him formulate an answer. The case against the historicity of the exodus is straightforward, and its essence can be stated in five words: a sustained lack of evidence. Nowhere in the written record of ancient Egypt is there any explicit mention of Hebrew or Israelite slaves, let alone a figure named Moses. There is no mention of the Nile waters turning into blood, or of any series of plagues matching those in the Bible, or of the defeat of any pharaoh on the scale suggested by the Torah’s narrative of the mass drowning of Egyptian forces at the sea. Furthermore, the Torah states that 600,000 men between the ages of twenty and sixty left Egypt; adding women, children, and the elderly, we arrive at a population in the vicinity of two million souls. There is no archaeological or other evidence of an ancient encampment that size anywhere in the Sinai desert. Nor is there any evidence of so great a subsequent influx into the land of Israel, at any time. No competent scholar or archaeologist will deny these facts. Case closed, then? For those who would defend the plausibility of a historical exodus, what possible response can there be? Let’s begin with the missing evidence of the Hebrews’ existence in Egyptian records. It is true enough that these records do not contain clear and unambiguous reference to “Hebrews” or “Israelites.” But that is hardly surprising. The Egyptians referred to all of their West-Semitic slaves simply as “Asiatics,” with no distinction among groups—just as slave-holders in the New World never identified their black slaves by their specific provenance in Africa. More generally, there is a limit to what we can expect from the written record of ancient Egypt. Ninety-nine percent of the papyri produced there during the period in question have been lost, and none whatsoever has survived from the eastern Nile delta, the region where the Torah claims the Hebrew slaves resided. Instead, we have to rely on monumental inscriptions, which, being mainly reports to the gods about royal achievements, are far from complete or reliable as historical records. They are more akin to modern-day résumés, and just as conspicuous for their failure to note setbacks of any kind. We’ll have reason to revisit such inscriptions later on. But now let’s consider the absence of specifically archaeological evidence of the exodus. In fact, many major events reported in various ancient writings are archaeologically invisible. The migrations of Celts in Asia Minor, Slavs into Greece, Arameans across the Levant—all described in written sources—have left no archeological trace. And this, too, is hardly surprising: archaeology focuses upon habitation and building; migrants are by definition nomadic. There is similar silence in the archaeological record with regard to many conquests whose historicity is generally accepted, and even of many large and significant battles, including those of relatively recent vintage. The Anglo-Saxon conquest of Britain in the 5th century, the Arab conquest of Palestine in the 7th century, even the Norman invasion of England in 1066: all have left scant if any archaeological remains. Is this because conquest is usually accompanied by destruction? Not really: the biblical books of Joshua and Judges, for instance, tell of a gradual infiltration into the land of Israel, with only a small handful of cities said to have been destroyed. And what is true of antiquity holds true for many periods in military history in which conquest has in no sense entailed automatic destruction. While on the topic of archaeological evidence, let me also dispose of the issue of a “mass” exodus of two million Israelites. This, although it looms large in the case against the historicity of the exodus, is something of a red herring, and warrants a brief discussion of its own. In fact, despite the Bible’s apparent declaration that Israelite men numbered 600,000 when they left Egypt, a wealth of material in the Torah points to a number dramatically and perhaps even exponentially lower. For one thing, the book of Exodus (23:29-30) claims that the Israelites were so few in number as to be incapable of populating the land they were destined to enter; similarly, in referring to them as the smallest nation on the face of the earth, the book of Deuteronomy (7:7) says they were badly outnumbered by the inhabitants of the land. The book of Numbers (3:43) records the number of first-born Israelite males of all ages as 22,273; to have so few first-born males in a population totaling in excess of two million would have required a fertility rate of many dozens of children per woman—a phenomenon unmentioned by the Torah and not evidenced in any family lineages from that period in other ancient Near Eastern sources. Besides, an encampment of two million—equivalent to the population of Houston, Texas—would have taken days to traverse. Yet the Torah (Exodus 33:6-11) does not remark upon that, either, instead describing Israelites routinely exiting and returning to the camp with ease. Nor does it register the bedlam and gridlock that would have been created by the system of centralized sacrifices mandated in the book of Leviticus. In Exodus 15:27, moreover, the Israelites are reported camping at a particular desert oasis that boasted 70 date palms—which, for a population of two million, would have to have fed and sheltered 30,000 people per tree! Many details of the exodus story do appear to reflect the realities of ancient Egypt. What’s more, they’re details that a scribe living centuries later and inventing the story afresh would have been unlikely to know. Why is the figure of 600,000 fighting-age males so wildly out of sync with so many other elements in the Torah’s desert account? Here we encounter a peculiarity characteristic of the Bible as a whole. If, by and large, its stated proportions and dimensions—like those given for the Tabernacle in the desert, or for Solomon’s Temple—are realistic enough, the exceptions occur almost universally in one sphere. This is the military, where we find numbers reaching truly “biblical” magnitudes. It is therefore far less surprising than it may seem that the archaeological record is lacking evidence of the Israelite encampment and influx into the land. The population, after all, may not have been terribly great. In light of what we’ve seen so far, should the historicity of the exodus still be denied by reason of absence of evidence? Or can we now invoke the familiar and all-too-true quip that absence of evidence is not evidence of absence? There is rich evidence that West-Semitic populations lived in the eastern Nile delta—what the Bible calls Goshen—for most of the second millennium. Some were slaves, some were raised in Pharaoh’s court, and some, like Moses, bore Egyptian names. We know today that the great pharaoh Ramesses II, who reigned from 1279 to 1213 BCE, built a huge administrative center out of mudbrick in an area where large Semitic populations had lived for centuries. It was called Pi-Ramesses. 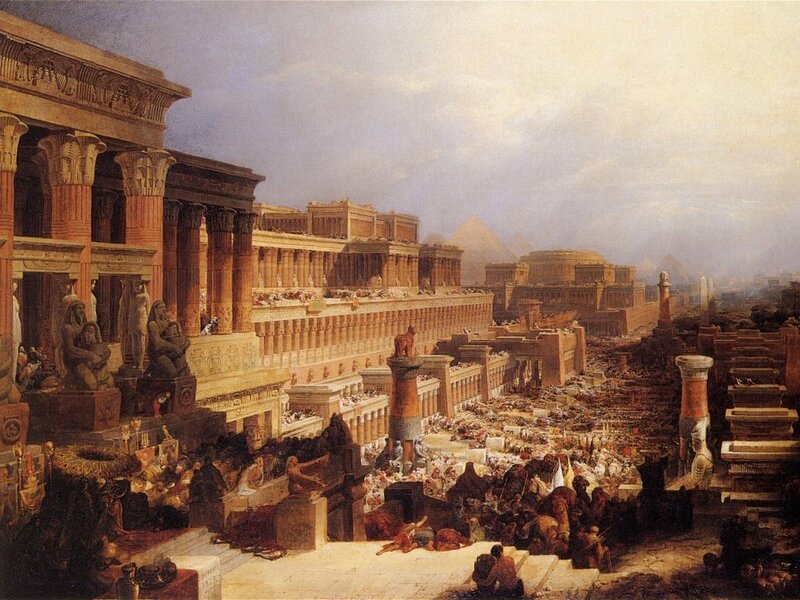 Exodus (1:11) specifies that the Hebrew slaves built the cities of Pithom and Ramesses, a possible reference to Pi-Ramesses. The site was abandoned by the pharaohs two centuries later. In the exodus account, pharaohs are simply called “Pharaoh,” whereas in later biblical passages, Egyptian monarchs are referred to by their proper name, as in “Pharaoh Necho” (2 Kings 23:29). This, too, echoes usage in Egypt itself, where, from the middle of the second millennium until the tenth century BCE, the title “Pharaoh” was used alone. The names of various national entities mentioned in the Song at the Sea (Exodus 15:1-18)—Philistines, Moabites, Edomites, et al.—are all found in Egyptian sources shortly before 1200 BCE; about this, the book of Exodus is again correct for the period. The stories of the exodus and the Israelites’ subsequent wanderings in the wilderness reflect sound acquaintance with the geography and natural conditions of the eastern Nile delta, the Sinai peninsula, the Negev, and Transjordan. The book of Exodus (13:17) notes that the Israelites chose not to traverse the Sinai peninsula along the northern, coastal route toward modern-day Gaza because that would have entailed military engagement. The discovery of extensive Egyptian fortifications all along that route from the period in question confirms the accuracy of this observation. Archaeologists have documented hundreds of new settlements in the land of Israel from the late-13th and 12th centuries BCE, congruent with the biblically attested arrival there of the liberated slaves; strikingly, these settlements feature an absence of the pig bones normally found in such places. Major destruction is found at Bethel, Yokne’am, and Hatzor—cities taken by Israel according to the book of Joshua. 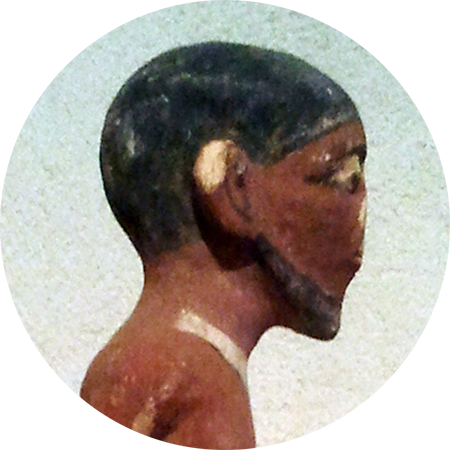 At Hatzor, archaeologists found mutilated cultic statues, suggesting that they were repugnant to the invaders. The earliest written mention of an entity called “Israel” is found in the victory inscription of the pharaoh Merneptah from 1206 BCE. 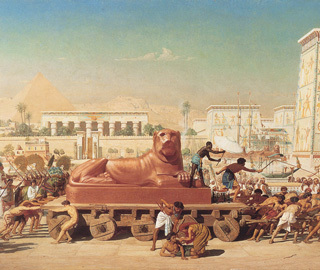 In it the pharaoh lists the nations defeated by him in the course of a campaign to the southern Levant; among them, “Israel is laid waste and his seed is no more.” “Israel” is written in such a way as to connote a group of people, not an established city or region, the implication being that it was not yet a fully settled entity with contiguous control over an entire region. This jibes with the Bible’s description in Joshua and Judges of a gradual conquest of the land. Of course, some scholars maintain that remnants like the Merneptah stele tell us nothing at all about a supposed exodus, only that there existed a nomadic entity named Israel in the land of Canaan in 1206 BCE, who for all we know could have been an indigenous people. Others, however, basing themselves on the same stele, suggest that we should date the exodus of the Israelites to a period shortly before the inscription was written—namely, to the reign of Ramesses II. Here we come to a larger issue and a subject of intense scholarly debate: can the Bible be trusted on anything as a historical source? In this latter claim, a methodological leap is at work, one that combines archaeological evidence (the Merneptah inscription) with biblical evidence (the exodus narrative) on the way to reaching a conclusion favorable to the latter. Some view this as legitimate practice; others cry foul. But here we come to a larger issue and a subject of intense scholarly debate: can the Bible be trusted on anything as a historical source? Should it be considered “innocent” (i.e., historically accurate) until proved “guilty” (i.e., erroneous), or “guilty” unless and until its claims can be corroborated by external sources? To this issue, which bears centrally on our topic, we must now turn. As a credible historical source, the Bible has many strikes against it. It contains materials like the Garden of Eden story that seem frankly mythical in nature. It recounts supernatural occurrences that a modern historian cannot accept as factual, and it regularly describes earthly actions as the results of divine causation. Many of its texts, scholars believe, were composed centuries after the events purportedly documented, and—as with the exodus—few of those events can be corroborated by independent outside sources. In short, the Bible in this view is a book of religious propaganda: “history” that suits its writers’ purposes. And the view is well-buttressed. But it is no less problematic for that, and the reason is simple: many other historical inscriptions from the ancient Near East—and elsewhere—are susceptible of the same charge. Cuneiform and hieroglyphic texts that tell of divine revelations to royal figures are found everywhere: overt propaganda on behalf of the kings of yore and the gods they served. Nor can most of the events recorded in these ancient records be corroborated by cross-reference to sources from other cultures. Frequently, the events themselves are miraculous: a pharaoh defeats enemy legions single-handedly, for example, or the sculpted image of a serpent in the pharaoh’s diadem spews forth an all-consuming fire; troop figures are impossibly large. Often, the events occurred, if they occurred at all, centuries before the text’s date of composition. Yet, to one degree or another, scholars routinely accept these texts as historically reliable. Scholars today use the works of Livy to reconstruct the history of the Roman republic, founded several centuries before his lifetime, and all historians of Alexander the Great acknowledge as their most accurate source Arrian’s Anabasis, which dates from four centuries later. Of course, they exclude the blatantly unrealistic elements, which they peel away from the remainder before crediting its reliability. By contrast, however, when it comes to biblical sources, the questionable elements are often taken as prima-facie evidence of the untrustworthiness of the whole. Scholars routinely accept texts containing supernatural occurrences as historically reliable. Except, that is, in the case of the Bible. This is all the more remarkable (to put it mildly) in light of one significant difference between biblical literature and the writings of other ancient Near Eastern civilizations. Throughout, the Bible displays a penchant for judging its heroes harshly, and for recording Israel’s failings even more than its successes. No other ancient Near Eastern culture produced a literature so revealing of fault, so realistic about the abuses of power, or so committed to recording those abuses for posterity. On this point, at least, there is universal agreement. Yet in academic precinct, recognition of this fact hasn’t in the least improved the Bible’s reputation as an honest reporter of historical events. Here’s a thought experiment: imagine the Bible had never spoken about Hebrew enslavement or of an exodus from Egypt. Instead, a story much like it turned up in a first-millennium BCE inscription from a dig in Transjordan, the land of the ancient Moabites. Telling of the earliest period of this people and their deity Kemosh, the inscription reports that the Moabites were slaves in Egypt but mighty Kemosh defeated Amun and Re at the sea, liberating the slaves and enabling them to set out homeward to Moab while their enemies perished under a storm of hail. In the face of such an account, scholars would assuredly be skeptical of the theological and supernatural elements, but I suspect they would look for clues of an authentic core, especially if there were peripheral evidence of the kind I pointed to above in connection with the biblical account. They would be impressed, for instance, with the story’s demonstrable familiarity with Egyptian names, its awareness of settlement patterns in the eastern delta and of the correct way of naming the pharaoh, its cognizance of royal fortifications outside of Egypt and the geography of the Sinai peninsula, the Negev, and Transjordan. Above all, they would seize on contemporaneous confirmation of the Moabites’ existence in non-Moabite sources. A fresco from the ancient Dura Europos synagogue in Syria showing the Jews crossing the Red Sea with Pharaoh in pursuit.Wikimedia. Would these hypothetical scholars also pounce on the lack of any mention of Moabite slaves in Egyptian sources? I doubt it: that so many of the account’s details accord with our knowledge of the period would lead many to assess the source as trustworthy—especially in the absence of hard evidence to the contrary. The reliability of ancient sources—extra-biblical as well as biblical—is a vexing issue. Where does reality end and the sculpting of events to produce a message begin? From an academic perspective, the Bible should be subject to criteria of analysis applied to other comparable ancient texts. The fact that it is not so treated—that a double standard is in operation—tells us something about the field of academic biblical studies, and about the academy itself. The double standard applied to biblical texts is a key aspect of an ongoing power struggle within biblical studies, which as an academic discipline is somewhat anomalous within the humanities. The Bible is studied today in degree-granting institutions of all kinds, from the fully secular to the most dogmatically committed. But unlike Shakespeare, or the orations of Cicero, or the Gilgamesh epic, or the Code of Hammurabi, the Bible is itself anomalous: not only a work that people read and study but, for many, a work that guides life itself, a work of sacred scripture. One may safely assume that proposals to the Society for Neuroscience do not merit similar warnings. To an extent, again, one can appreciate the sense of alarm. “Because the Bible says so!” and “Because God said so!” do not qualify as academic arguments. Yet, if the ideal is “open academic discussion” and “a common standard of scholarly discourse,” overzealousness from the other direction should be no less disturbing. In the drive to keep fundamentalists at bay, some scholars have wound up throwing out the Bible with the bathwater, preemptively downgrading its credibility as a historical witness. The power struggle within biblical studies is an aspect of the larger culture war that rages between liberals and conservatives in the U.S. (and, with different expressions, in Israel). And that is not all. The power struggle within biblical studies is also an aspect of the larger culture war that rages between liberals and conservatives in the U.S. (and, with different expressions, in Israel). In that war, the place of religion in the public square is a major battleground, with skirmishes over hot-button issues ranging from abortion and gay marriage to public display of the Ten Commandments. The fight plays itself out in the realm of law and public policy, in the media, and also in the universities; in the last-named arena, whole fields of inquiry are drawn into the fray. One larger-than-academic dispute is over the status of evolutionary psychology as a science; another is over the status of the Bible as a historical witness. Once ideology enters the picture, the stain can spread: attempts by Arab intellectuals and political leaders to deny the Jews an ancient past in the land of Israel may seem risible to some, but they have been given an aura of respectability in works like The Invention of Ancient Israel: The Silencing of Palestinian History, by a scholar at one of the most prominent biblical-studies programs in the UK. In the past years, two major academic conferences have been devoted to the historicity of the exodus accounts, and their respective titles tell all. One, most of whose participants doubted that there was an exodus, was titled Out of Egypt: Israel’s Exodus between Text and Memory, History and Imagination. The other, convened in explicit response to the first, was titled A Consultation on the Historicity and Authenticity of the Exodus and Wilderness Traditions in a Post-Modern Age. The “liberal” conference was held in California, the “conservative” one in Texas. 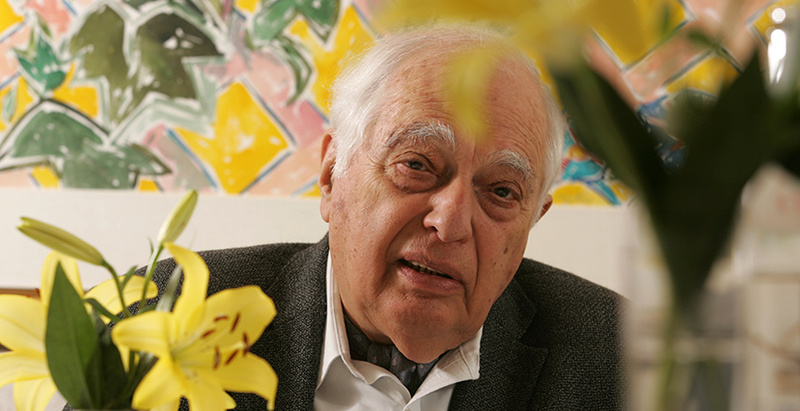 There is thus great truth in the statement by the archaeologist and Israel Prize winner Amihai Mazar that “[t]he interpretation of archaeological data and its association with the biblical text may in many cases be a matter of subjective judgment, . . . inspired by the scholar’s personal values, beliefs, ideology, and attitude toward the [data].” In brief: tell me a scholar’s view on the historicity of the exodus, and I will likely be able to tell you how he voted in the last presidential election. To sum up thus far: there is no explicit evidence that confirms the exodus. At best, we have a text—the Hebrew Bible—that exhibits a good grasp of a wide range of fairly standard aspects of ancient Egyptian realities. This is definitely something, and hardly to be sneezed at; but can we say still more? At the Texas conference, I presented findings that suggest an explicit link between the biblical account and a specific text from a specific reign in Egyptian history. A fuller account of my investigation and its conclusions will appear in Did I Not Bring Israel Out of Egypt?, a forthcoming volume of the conference proceedings edited by Alan Millard, Gary Rendsburg, and James Hoffmeier. Here, I present the key findings publicly for the first time. One of the pillars of modern critical study of the Bible is the so-called comparative method. Scholars elucidate a biblical text by noting similarities between it and texts found among the cultures adjacent to ancient Israel. If the similarities are high in number and truly distinctive to the two sources, it becomes plausible to maintain that the biblical text may have been written under the direct influence of, or in response to, the extra-biblical text. Why the one-way direction, from extra-biblical to biblical? The answer is that Israel was largely a weak player, surrounded politically as well as culturally by much larger forces, and no Hebrew texts from the era prior to the Babylonian exile (586 BCE) have ever been found in translation into other languages. Hence, similarities between texts in Akkadian or Egyptian and the Bible are usually understood to reflect the influence of the former on the latter. Although the comparative method is commonly thought of as a modern approach, its first practitioner was none other than Moses Maimonides in the 12th century. In order to understand Scripture properly, Maimonides writes, he procured every work on ancient civilizations known in his time. In his Guide of the Perplexed, he puts the resultant knowledge to service in elucidating the rationale behind many of the Torah’s cultic laws and practices, reasoning that they were adaptations of ancient pagan customs, but tweaked in conformity with an anti-pagan theology. (I have written on the rabbinic mandate to view the Torah in ancient context here, and on the Torah’s revolution in ancient political thought here.) At the end of the Guide, Maimonides states that his insight into the topic would have been much greater had he been able to discover even more such sources. Why would the book of Exodus describe God in the same terms used by the Egyptians to exalt their pharaoh? We see here the dynamics of appropriation. Comparative method can yield dazzling results, adding dimensions of understanding to passages that once seemed either unclear or self-evident and unexceptional. As an example, consider the familiar biblical refrain that God took Israel out of Egypt “with a mighty hand and an outstretched arm.” The Bible could have employed that phrase to describe a whole host of divine acts on Israel’s behalf, and yet the phrase is used only with reference to the exodus. This is no accident. In much of Egyptian royal literature, the phrase “mighty hand” is a synonym for the pharaoh, and many of the pharaoh’s actions are said to be performed through his “mighty hand” or his “outstretched arm.” Nowhere else in the ancient Near East are rulers described in this way. What is more, the term is most frequently to be found in Egyptian royal propaganda during the latter part of the second millennium. Why would the book of Exodus describe God in the same terms used by the Egyptians to exalt their pharaoh? We see here the dynamics of appropriation. During much of its history, ancient Israel was in Egypt’s shadow. For weak and oppressed peoples, one form of cultural and spiritual resistance is to appropriate the symbols of the oppressor and put them to competitive ideological purposes. I believe, and intend to show in what follows, that in its telling of the exodus the Bible appropriates far more than individual phrases and symbols—that, in brief, it adopts and adapts one of the best-known accounts of one of the greatest of all Egyptian pharaohs. Here a few words of background are in order. Like all great ancient empires, ancient Egypt waxed and waned. The zenith of its glory was reached during the New Kingdom, roughly 1500-1200 BCE. It was then that its borders reached their farthest limits and many of the massive monuments still visible today were built. We have already met the greatest pharaoh of this period: Ramesses II, also known fittingly as Ramesses the Great, who reigned from 1279 to 1213. Ramesses’ paramount achievement, which occurred early in his reign, was his 1274 victory over Egypt’s arch-rival, the Hittite empire, at the battle of Kadesh: a town located on the Orontes River on the modern-day border between Lebanon and Syria. 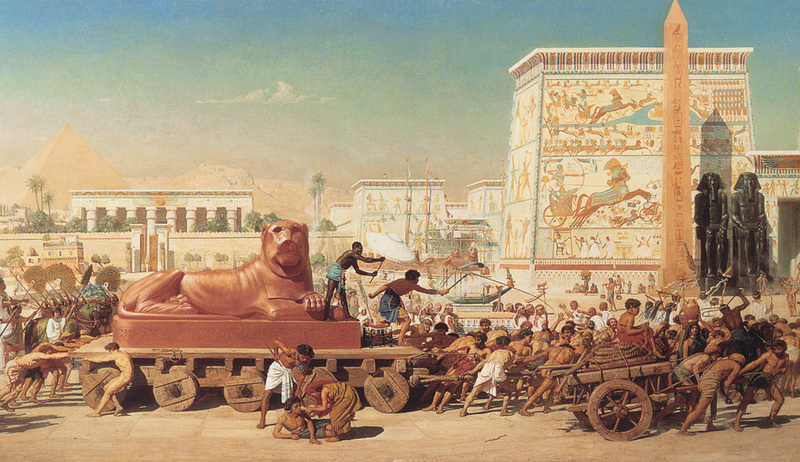 Upon his return to Egypt, Ramesses inscribed accounts of this battle on monuments all across the empire. Ten copies of the inscriptions exist to this day. These multiple copies make the battle of Kadesh the most publicized event anywhere in the ancient world, the events of Greece and Rome not excepted. 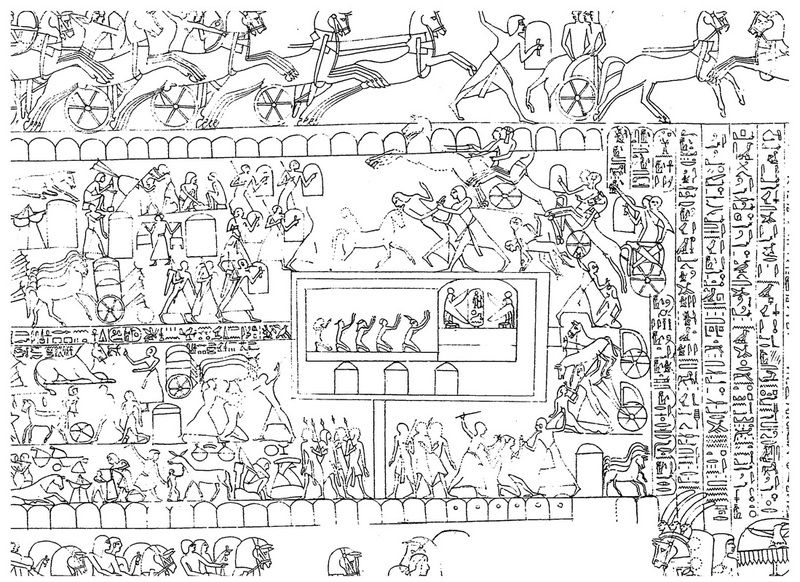 Moreover, the texts were accompanied by a new creation: bas reliefs depicting the battle, frame by frame, so that—much as with stained-glass windows in medieval churches—viewers illiterate in hieroglyphics could learn about the pharaoh’s exploits. Enter now a longstanding biblical conundrum. Scholars had long searched for a model, a precursor, that could have inspired the design of the Tabernacle that served as the cultic center of the Israelites’ encampment in the wilderness, a design laid out in exquisite verbal detail in Exodus 25-29. Although the remains of Phoenician temples reveal a floor plan remarkably like that of Solomon’s temple (built, as it happens, with the extensive assistance of a Phoenician king), no known cultic site from the ancient Near East seemed to resemble the desert Tabernacle. Then, some 80 years ago, an unexpected affinity was noticed between the biblical descriptions of the Tabernacle and the illustrations of Ramesses’ camp at Kadesh in several bas reliefs. The throne tent of Ramesses II with winged falcons flanking his cartouche at Abu Simbel. W. Wreszinski, Atlas zur altägyptischen Kulturgeschichte Vol. II (1935), pl. 169. The camp is twice as long as it is wide. The entrance to it is in the middle of the eastern wall, on the left. (In Egyptian illustrations, east is left, west is right.) At the center of the camp, down a long corridor, lies the entrance to a 3:1 rectangular tent. This tent contains two sections: a 2:1 reception tent, with figures kneeling in adoration, and, leading westward (right) from it, a domed square space that is the throne tent of the pharaoh. In Exodus (25:20), the ark of the Tabernacle is similarly flanked by two winged cherubim, whose wings hover protectively over it. To complete the parallel, Egypt’s four army divisions at Kadesh would have camped on the four sides of Ramesses’ battle compound; the book of Numbers (2) states that the tribes of Israel camped on the four sides of the Tabernacle compound. 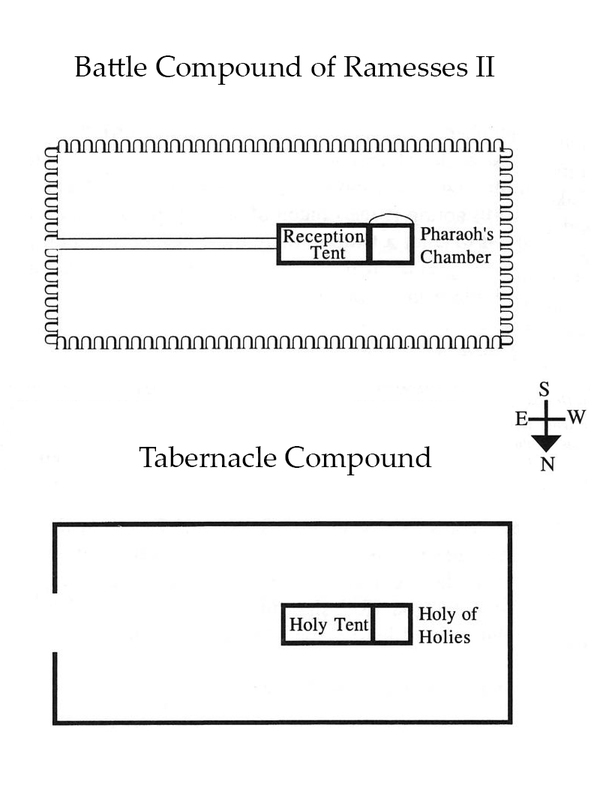 The resemblance of the military camp at Kadesh to the Tabernacle goes beyond architecture; it is conceptual as well. For Egyptians, Ramesses was both a military leader and a divinity. In the Torah, God is likewise a divinity, obviously, but also Israel’s leader in battle (see Numbers 10:35-36). The tent of God the divine warrior parallels the tent of the pharaoh, the living Egyptian god, poised for battle. What have scholars made of this observation? All agree that no visual image known to us from the ancient record so closely resembles the Tabernacle as does the Ramesses throne tent. Nor is there any textual description of a cultic tent or throne tent in a military camp that matches these dimensions. On this basis, some scholars have indeed suggested that the bas reliefs of the Kadesh inscriptions inspired the Tabernacle design found in Exodus 25-27. In their thinking, the Israelites reworked the throne tent ideologically, with God displacing Ramesses the Great as the most powerful force of the time. (For the Torah, of course, God cannot be represented in an image and requires no protection, and pagan deities have no standing, which is why, instead of falcons and Horus, we have cherubim hovering protectively over the ark bearing the tablets of His covenant with Israel.) Others suspect that the image of the throne tent initially became absorbed within Israelite culture in ways that we cannot trace and was later incorporated into the text described in Exodus, but with no conscious memory of Ramesses II. Still others remain skeptical, considering the similarities to be merely coincidental. I had a different reaction. With my interest piqued by the visual similarities between the Tabernacle and the Ramesses throne tent, I decided to have a closer look at the textual components of the Kadesh inscriptions, to learn what they had to say about Ramesses, the Egyptians, and the battle of Kadesh. At first, a few random items—like the reference to pharoah’s mighty arm, mentioned above—jumped out at me as resonant with the language of the account in Exodus. But as I read and reread, I realized that much more than individual phrases or images was involved here—that the similarities extended to the entire plot line of the Kadesh poem and that of the splitting of the sea in Exodus 14-15. The more I investigated other battle accounts from the ancient Near East, the more forcefully this similarity struck me—to the point where I believe it reasonable to claim that the narrative account of the splitting of the sea (Exodus 14) and the Song at the Sea (Exodus 15) may reflect a deliberate act of cultural appropriation. If the Kadesh inscriptions bear witness to the greatest achievement of the greatest pharaoh of the greatest period in Egyptian history, then the book of Exodus claims that the God of Israel overmastered Ramesses the Great by several orders of magnitude, effectively trouncing him at his own game. With my interest piqued by the visual similarities between the Tabernacle and the Ramesses throne tent, I decided to have a closer look at the text. Let’s see how this works. In both the Kadesh poem and the account of Exodus 14-15, the action begins in like fashion: the protagonist army (of, respectively, the Egyptians and Israelites) is on the march and unprepared for battle when it is attacked by a large force of chariots, causing it to break ranks in fear. 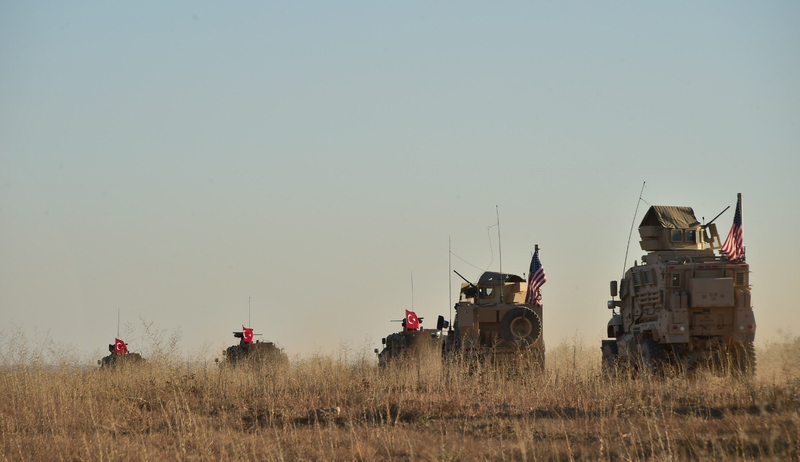 Thus, according to the Kadesh poem, Ramesses’ troops were moving north toward the outskirts of Kadesh when they were surprised by a Hittite chariot corps and took fright. The Exodus account opens in similar fashion. 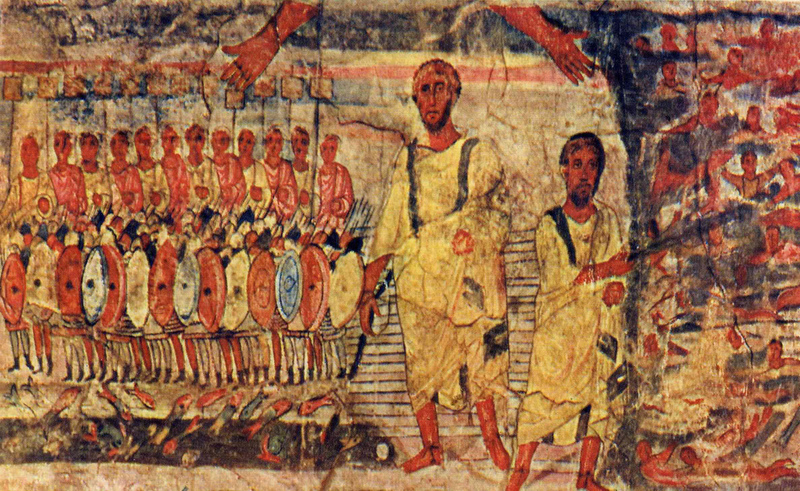 As they depart Egypt, the Israelites are described as an armed force (Exodus 13:18 and 14:8). Stunned by the sudden charge of Pharaoh’s chariots, however, they become completely dispirited (14:10-12). In each story, the protagonist now appeals to his god for help and the god exhorts him to move forward with divine assistance. In the Kadesh poem, Ramesses prays to Amun, who responds, “Forward! I am with you, I am your father, my hand is with you!” (Throughout, translations of the poem are from Kenneth A. Kitchen, Ramesside Inscriptions Translated & Annotated, Blackwell, Vol. 2, pp. 2-14.) In like fashion, Moses cries out to the Lord, who responds in 14:15, “Tell the Israelites to go forward!” promising victory over Pharaoh (vv. 16-17). From this point in the Kadesh poem, Ramesses assumes divine powers and proportions. Put differently, he shifts from human leader in distress to quasi-divine force, thus allowing us to examine his actions against the Hittites at the Orontes alongside God’s actions against the Egyptians at the sea. In each account, the “king” confronts the enemy on his own, unaided by his fearful troops. 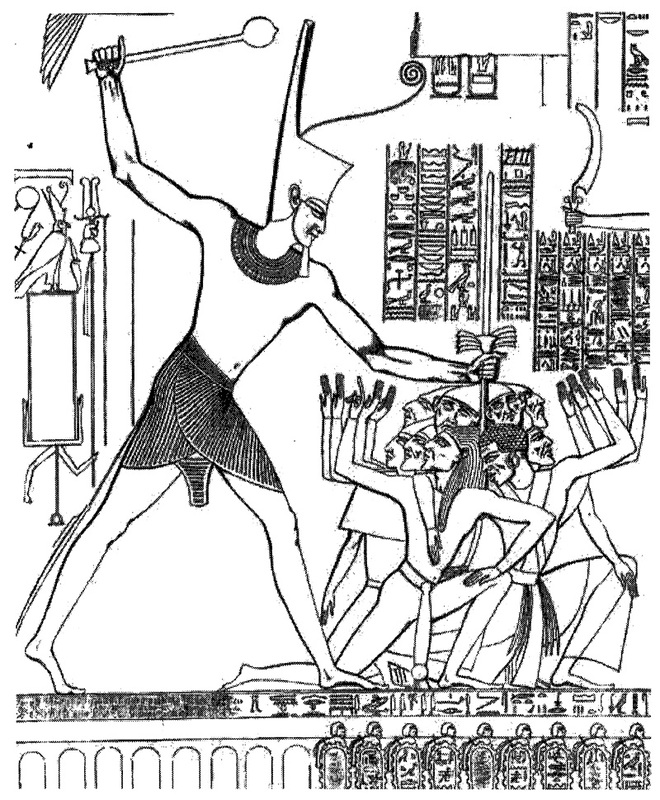 Entirely abandoned by his army, Ramesses engages the Hittites single-handedly, a theme underscored throughout the poem. In Exodus 14:14, God declares that Israel need only remain passive, and that He will fight on their behalf: “The Lord will fight for you, and you will be still.” Especially noteworthy here is that this particular feature of both works—their parallel portrait of a victorious “king” who must work hard to secure the loyalty of those he saves in battle—has no like in the literature of the ancient Near East. The corpses of the Hittite troops in the Orontes River as depicted on the second pylon at the Ramasseum. James Henry Breasted, The Battle of Kadesh: A Study in the Earliest Known Military Strategy (Chicago University Press, 1903), pl. III. Then when my troops and chariotry saw me, that I was like Montu , my arm strong, . . . then they presented themselves one by one, to approach the camp at evening time. They found all the foreign lands, among which I had gone, lying overthrown in their blood . . . . I had made white [with their corpses] the countryside of the land of Kadesh. Then my army came to praise me, their faces [amazed/averted] at seeing what I had done. Exodus 14:30-31 is remarkably similar, and in two cases identical: “Israel saw the Egyptians dead on the shore of the sea. And when Israel saw the great hand which the Lord had wielded against the Egyptians, the people feared the Lord.” As I noted earlier, “great hand” here and “great arm” in 15:16 are used exclusively in the Hebrew Bible with regard to the exodus, a trope found elsewhere only within Egyptian propaganda, especially during the late-second-millennium New Kingdom. Relief of Seti I (13th c. BCE) with raised right hand, shattering the heads of his enemies, Hypostyle Hall at Karnak. 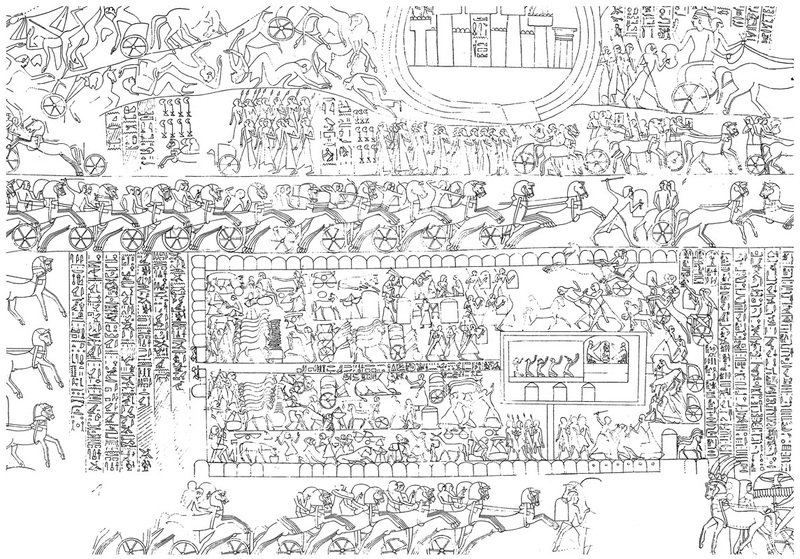 The Epigraphic Survey, The Battle Reliefs of King Seti I (Chicago, 1986), pl. 15a. Courtesy of the Oriental Institute of the University of Chicago. Continuing now: in the Kadesh poem, as the troops review the Hittite corpses, their enemies are likened to chaff: “Amun my father being with me instantly, turning all the foreign lands into chaff before me.” The Song similarly compares the enemy with chaff consumed by God’s wrath (15:7): “You send forth Your fury, it consumes them like chaff.” Again, no other ancient Near Eastern military inscription uses “chaff” as a simile for the enemy. The Exodus text focuses on precisely those elements of the Kadesh poem that extol the pharaoh’s valor, which it reworks for purposes of extolling God’s. He having arrived peacefully in Egypt, at Pi-Ramesses Great in Victories, and resting in his palace of life and dominion, . . . the gods of the land [come] to him in greeting . . . according as they have granted him a million jubilees and eternity upon the throne of Re, all lands and all foreign lands being overthrown and slain beneath his sandals eternally and forever. You will bring them and plant them in Your own mountain, the place You made Your abode, O Lord, the sanctuary, O Lord, which Your hands established. The Lord will reign forever and ever! 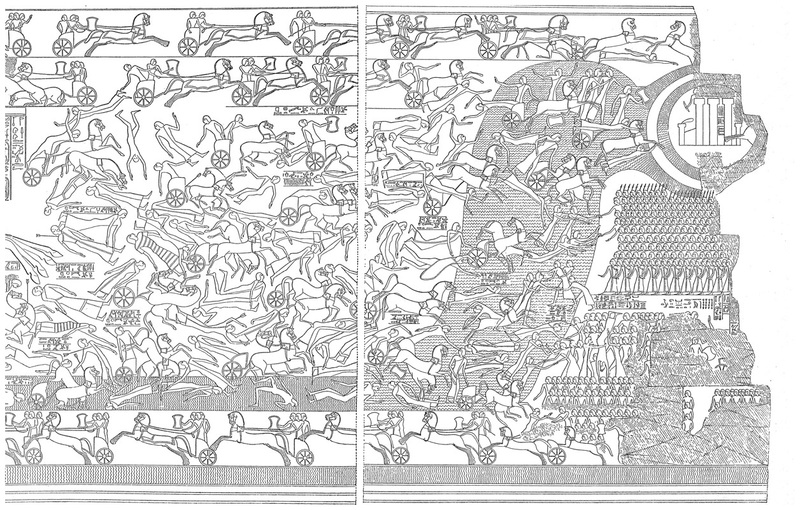 The protagonist army breaks ranks at the sight of the enemy chariot force; a plea for divine help is answered with encouragement to move forward, with victory assured; the enemy chariotry, recognizing by name the divine force that attacks it, seeks to flee; many meet their death in water, and there are no survivors; the king’s troops return to survey the enemy corpses; amazed at the king’s accomplishment, the troops offer a victory hymn that includes praise of his name, references to his strong arm, tribute to him as the source of their strength and their salvation; the enemy is compared to chaff, while the king is deemed without peer in battle; the king leads his troops peacefully home, intimidating foreign lands along the way; the king arrives at his palace, and is granted eternal rule. This is the story of Ramesses II in the Kadesh poem, and this is the story of God in the account of the sea in Exodus 14-15. Just how distinctive are these parallels? I’m fully aware that similarities between two ancient texts do not automatically imply that one was inspired by the other, and also that common terms and images were the intellectual property of many cultures simultaneously. Some of the motifs identified here, including the dread and awe of the enemy in the face of the king, are ubiquitous across battle accounts of the ancient Near East. Other elements, such as the king building or residing in his palace and gaining eternal rule, are typological tropes known to us from other ancient works. Still others, though peculiar to these two works, can arguably be seen as reflecting similar circumstances, or authorial needs, with no necessary connection between them. Thus, although few if any ancient battle accounts record an army on the march that is suddenly attacked by a massive chariot force and breaks ranks as a result, it could still be that Exodus and the Kadesh poem employ this motif independently. What really suggests a relation between the two texts, however, is the totality of the parallels, plus the large number of highly distinctive motifs that appear in these two works alone. No other battle account known to us either from the Hebrew Bible or from the epigraphic remains of the ancient Near East provide even half the number of shared narrative motifs exhibited here. To deepen the connection, let me adduce a further resonance between the Song at the Sea and Egyptian New Kingdom inscriptions more generally. A common literary motif of the period is the claim that the pharaoh causes enemy troops to cease their braggadocio. Thus, in a typical line, Pharaoh Seti I “causes the princes of Syria to cease all of the boasting of their mouths.” This concern with silencing the enemy’s boastings is distinctly Egyptian, not found in the military literature of any other neighboring culture. All the more noteworthy, then, that the Song at the Sea depicts not the movements or actions of the Egyptians but their boasts (15:8-9): “The enemy said, ‘I will pursue! I will overtake! I will divide the spoil! My desire shall have its fill of them, I will bare my sword, my hand shall subdue them!’” Thereupon, at God’s command, the sea covers them, effectively stopping their mouths. In my judgment, then, the similarities between these two texts are so salient, and so distinctive to them alone, that the claim of literary interdependence is wholly plausible. And so, a question: if, for argument’s sake, we posit that the Exodus sea account was composed with an awareness of the Kadesh poem, when could that poem have been introduced into Israelite culture? The question is important in itself, and also because the answer might help to date the Exodus text in turn. To determine a plausible date of transmission, we should be guided by the epigraphic evidence at hand. Egyptologists note that in addition to copies of the monumental version of the Kadesh poem, a papyrus copy was found in a village of workmen and artisans who built the great monuments at Thebes. As we saw earlier, visual accounts of the battle were also produced. This has led many scholars of ancient Egypt to argue that the Kadesh poem was a widely disseminated “little red book,” aimed at stirring public adoration of the valor and salvific grace of Ramesses the Great, and that it would have been widely known, particularly during the reign of Ramesses himself, beyond royal and temple precincts. Where does all this leave us? What does it prove? Proofs exist in geometry, and sometimes in law, but rarely within the fields of biblical studies and archaeology. As is so often the case, the record at our disposal is highly incomplete, and speculation about cultural transmission must remain contingent. We do the most we can with the little we have, invoking plausibility more than proof. To be plain about it, the parallels I have drawn here do not “prove” the historical accuracy of the Exodus account, certainly not in its entirety. They do not prove that the text before us received its final form in the 13th century BCE. And they can and no doubt will be construed by rational individuals, lay and professional alike, in different ways. Proofs exist in geometry, and sometimes in law, but rarely within the fields of biblical studies and archaeology.